Frankfort Avenue Steps Back in Time for the 18th Annual Olde Tyme Christmas Celebration | Joe Hayden Real Estate Team - Your Real Estate Experts! It's that time of year again – the time for good tidings and holiday cheer - and there's no shortage of events in Louisville to get you in the holiday spirit. This season, take advantage of "Olde Tyme Christmas on Frankfort Avenue" for lots of great holiday activities that the whole family will be sure to enjoy! 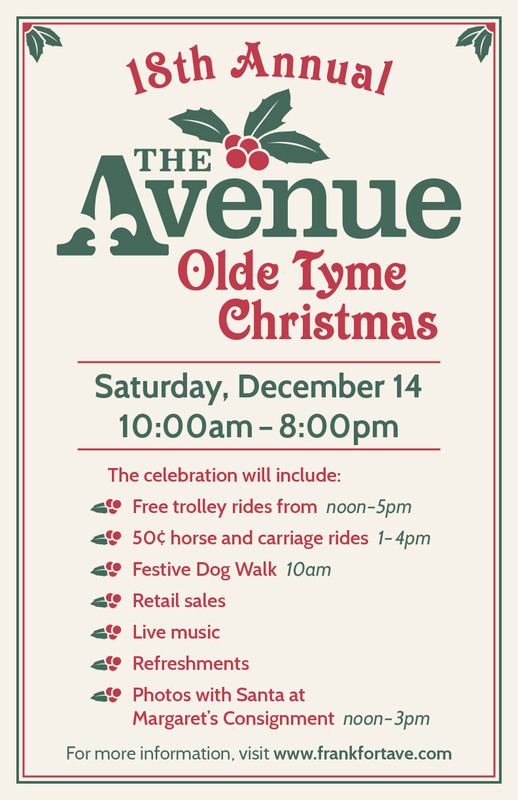 All About the "Olde Tyme"
This year, with events on December 7th and 14th, you can get your Christmas spirit on at the annual "Olde Tyme Christmas on Avenue". Featuring a wide assortment of holiday inspired activities, take your friends or your entire family to this fun Louisville event and they'll be sure to find something seasonal to indulge in. This event will feature live music, 50-cent horse-drawn carriage rides, seasonal refreshments for all to enjoy and even an appearance by Santa Claus for the kids or the aging Santa enthusiast. "Olde Tyme" is one the city's favorite holiday events! Located on the city's popular Frankfort Avenue, the area is a cultural hub featuring some of Louisville's best boutiques, galleries and restaurants. Some Seasonal Exercise to Get You in the Spirit! While the holiday season isn't always the best time for physical activity with the cold weather, "Olde Tyme Christmas" features a few Christmas centered activities to get your body into the holiday spirit! At 9:00 AM on December 7th, you can participate in the Santa Sprint and Stroll, an exercise event where all the proceeds will be donated to the United Crescent Hill Ministries. If that doesn't quite do it for you, you might want to try the Holiday Dog Walk on December 14th at 10:00 AM that starts out from the parking lot of the Crescent Hill Library. A good way to get your dog involved in all the fun festivities, this also features a Christmas-themed doggy costume contest. If your pooch happens to look more festive that the rest, you'll both win a prize! Finish Your Christmas Shopping or Indulge in Holiday Treats! As one of the city's best Christmas events, "Olde Tyme Christmas" also features a broad range of available goods for sale that may help you finish off your holiday shopping list. Offering up a variety of arts and craft all day long is the Holiday Open House at Hadley Pottery taking place on December 7th from 7 AM to 3 PM. Whether you're looking to round out your Christmas shopping or you just want to get started for the season, there will be plenty of gifts, hand-made pottery from the renowned artist Mary Alice Hadley and lots of goodies to quell your sweet cravings. With giveaways and lots of Christmas time discounts, this is an "Olde Tyme Christmas" event worth your while! If you're looking for some good time events this season to celebrate the holidays, you might want to make a visit some of the events of "Olde Tyme Christmas on Frankfort Avenue." From live music to seasonal crafts to a plethora of festive pastries, this is a great way to get everyone into the spirit of the season!